While in town for Digital Innovation Asia Conference, I ate at Benjarong Restaurant. 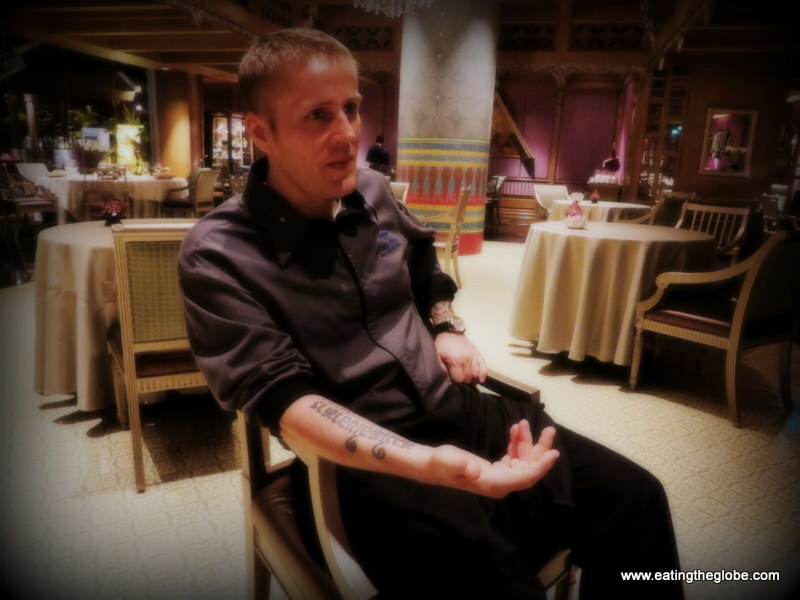 The Dusit Thani brought in Chef Morten Bojstrup to revamp their Thai fusion restaurant, Benjarong, and, wow, did they make a good decision when they decided to do that. He really has talent, and the entire meal was more than just a treat for the tastebuds. It was also one of those meals which happens to tantalize all the senses with its surprises. 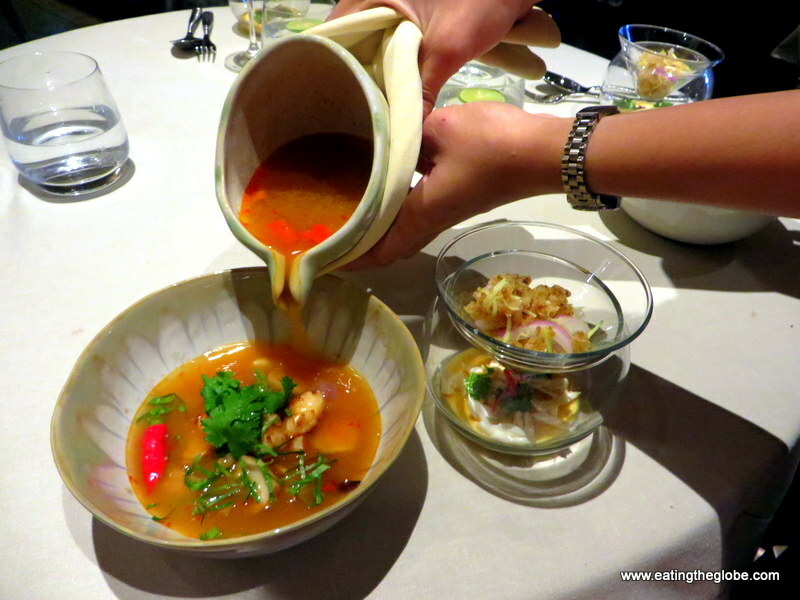 We enjoyed the Benjarong Signature Tasting Journey, and it was an absolute treat. The meal began with kaffir lime, red chili popcorn that was just plain addictive. I could have happily just eaten that all night, but the meal had just begun. The starter was a trio of deep-fried cuttlefish with turmeric, spiced scallop and papaya in coconut milk, and roasted pork leg with smoked chili tomato jam. It was an exciting way to awaken the taste buds. My favorite of the three was the scallop. I’ve never had a scallop paired with papaya and coconut milk, and the combination left me even more excited for what was to come. 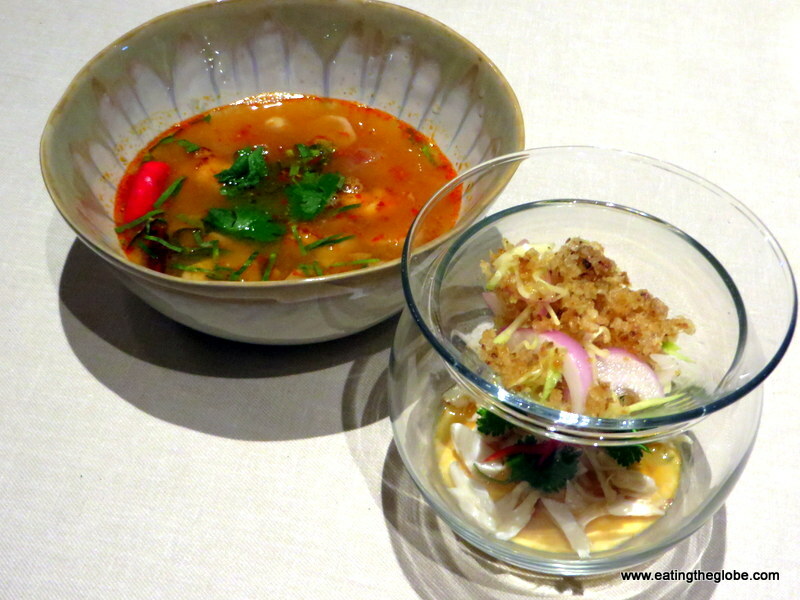 The next course was a perfectly spiced prawn tom yum soup that was paired with a crispy catfish salad made with green mango, crabmeat and tom yum custard. The presentation was beautiful, and I especially loved the textures of the catfish salad. This was followed by a salad of grilled wagyu beef with tomato, melon, and yam pudding that, once again, enticed the eyes from the moment the plate was set down in front of me. 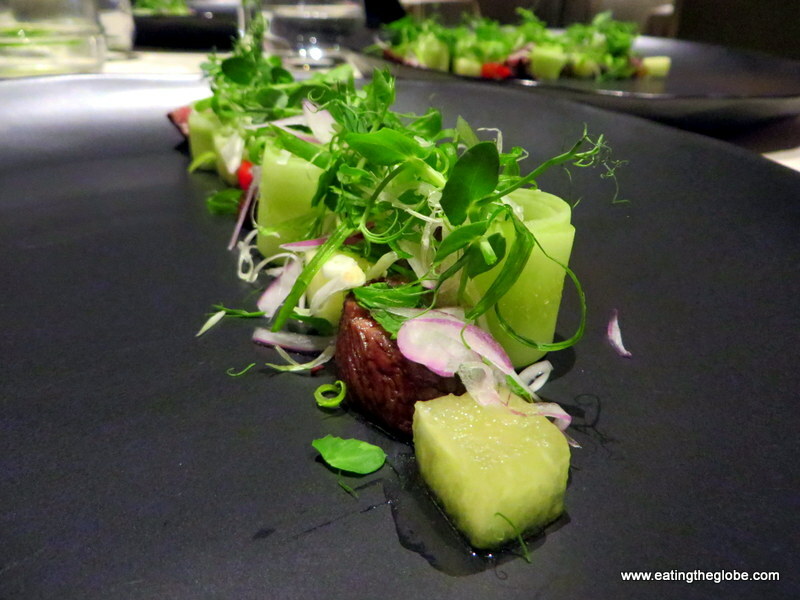 I also really liked the pairing of the melon with the beef. 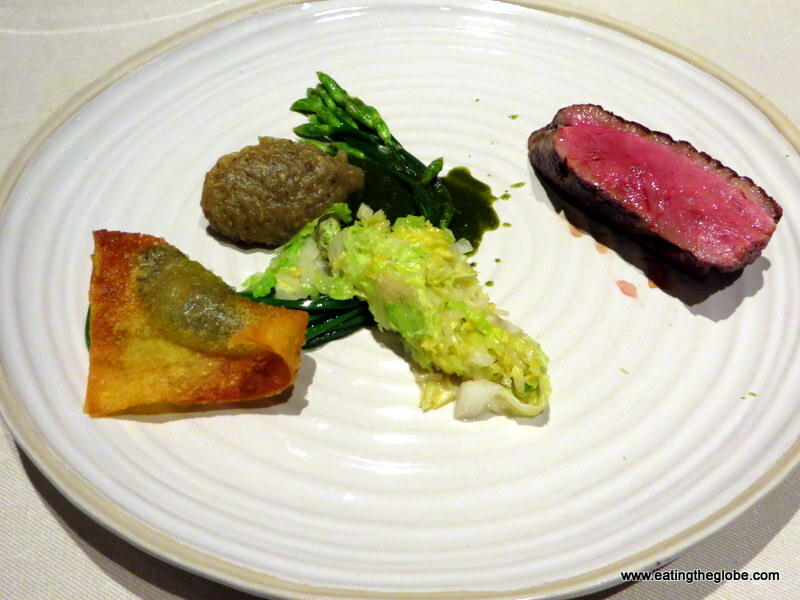 But, for me, the real show stealer was the sous vide cooked duck breast with smoked aubergine and the crispy wonton. Oh, wow! It was incredible. I’ve never had more perfectly cooked duck and the smoked eggplant was a perfect pairing to the duck. And, the duck wonton! It was an absolutely perfect wonton. I joked with the chef that I could have eaten about twenty of them. Unfortunately, the chef thought I was joking, and my hint went unnoticed. This whole dish was one of those perfect dishes that you think about for days after. Don’t skip the wine pairing, either, because the Cave La Suzienne, Mistralous, Cotes de Rhone is an outstanding match for the duck. 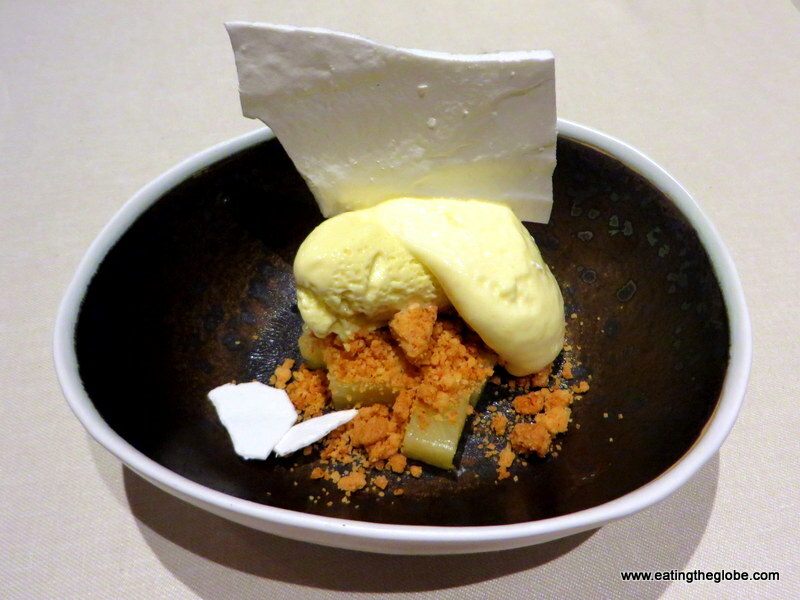 For dessert, we had Thai basil ice cream with pineapple and a salted meringue. The spiciness of the basil was a perfect match for creamy ice cream, and the salted meringue really completed this dessert. 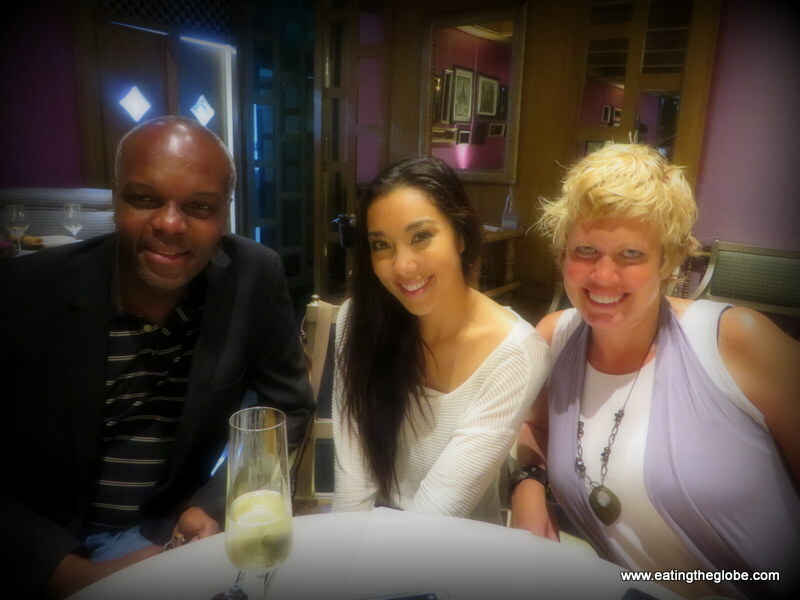 We all enjoyed our evening at Benjarong Restaurant, and it’s a great place to dine if you want to experience an elevated form of Thai food at its best. Disclosure: I received a complimentary meal at Benjarong, but all opinions are my own. 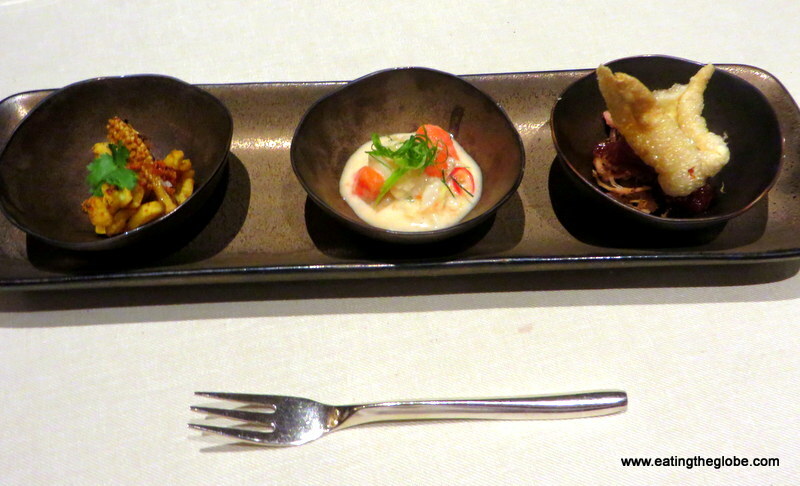 4 Responses to "Upscale Dining At Benjarong Thai Restaurant, Bangkok"
Great review of our dinner. I enjoyed the company of you two fine ladies as well. I have to say my favorite part was the Wagu beef :-). Also, Chef Morten is the coolest chef I’ve ever met. Loved your company, too, and, I agree Chef Morten was awesome! !